It’s not surprising that UFC strawweight champ Joanna Jędrzejczyk (-440) is the betting odds favorite with U.S. Sportsbooks over Rose Namajunas (+350) going into their championship title fight at UFC 217 on Nov. 4. The question is, can Rose somehow upset Joanna Champion and do what no one else has yet been able to? The short answer is yes, it’s possible, but not likely, and here’s why. The unbeaten Jedrzejczyk began the mental warfare awhile back and on this week’s UFC 217 conference call she took some shots some would say was below the belt. Namajunas has spoken openly about a history of mental illness in her family. And while that is certainly nothing to berate someone about, a fighter like Jedrzejczyk will look for any weakness in an opponent to exploit. As they say, the fight starts long before the two combatants step in the cage. On top of this Joanna’s record speaks for itself. She’s a perfect 14-0 with five successful title defenses against Jessica Penne, Valerie Letourneau, Claudia Gadelha, Karolina Kowalkiewicz, and most recently, Jessica Andrade. Joanna also holds a win over Carla Esparza, who submitted Rose in 2014. And Rose dropped a split decision to Kowalkiewicz in July of last year — while Joanna beat her by unanimous decision in her fourth title defense last November. Now Rose has showed marked improvement and looked great in her most recent fight, scoring a submission win over Michelle Waterson at UFC on Fox 24 in April. 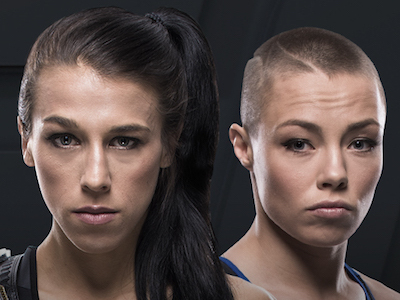 If she is able to upset Joanna, it would likely be by submission. However, I feel the champ will be adequately prepared to deal with Rose’s submission game.